The Mathisen Corollary: Time to sign up and send in your questions for the upcoming conversation on Celestial Foundations of the Bible! Time to sign up and send in your questions for the upcoming conversation on Celestial Foundations of the Bible! I'm looking forward to the upcoming conversation on the celestial foundations of the Bible, which is scheduled for this Saturday, December 2nd at 7pm Pacific time (which equates to 10pm Eastern time on December 2nd, for those in North America, and which equates to 3am UTC on December 3rd). The web-based interactive class will be ninety minutes long, and I'm planning to give a presentation with visual images and planetarium views for the first fifty minutes, followed by forty minutes for questions and discussion. You can reserve your space in the webinar by visiting this web page (look for the button that says "Add to Cart"). You can also receive a 50% discount from the price of the class by using the coupon code found on the "Video" page of my website (enter the coupon code during the checkout process, after you click "Add to Cart"). After you sign up, you will receive a link which will allow you to submit questions in advance, in case you prefer to ask questions that way rather than during the live webinar. The class will also be recorded, so that you can view it again later. Also, if you are unable to attend the class in person at the time that it is being offered, you can submit questions in advance and watch the recording at a different time, although of course I hope that as many people as possible can attend during the event itself. I will do my best to address all questions that are submitted. I am planning to discuss a few episodes and characters which I have not addressed in previous blog posts or videos, as well as some of the likely messages that various episodes and figures might be intended to convey to our understanding. If you have not already done so, you may find it worthwhile to view the discussion of the spiritual significance encoded in the "annual cycle of the year" which is presented in the previous post's video entitled "Heaven and Hell are celestial metaphors describing the Endless Circle of the Zodiac Wheel." During the presentation, we will see how this framework sheds light on the possible message conveyed by specific episodes in the scriptures of the Old and New Testaments. 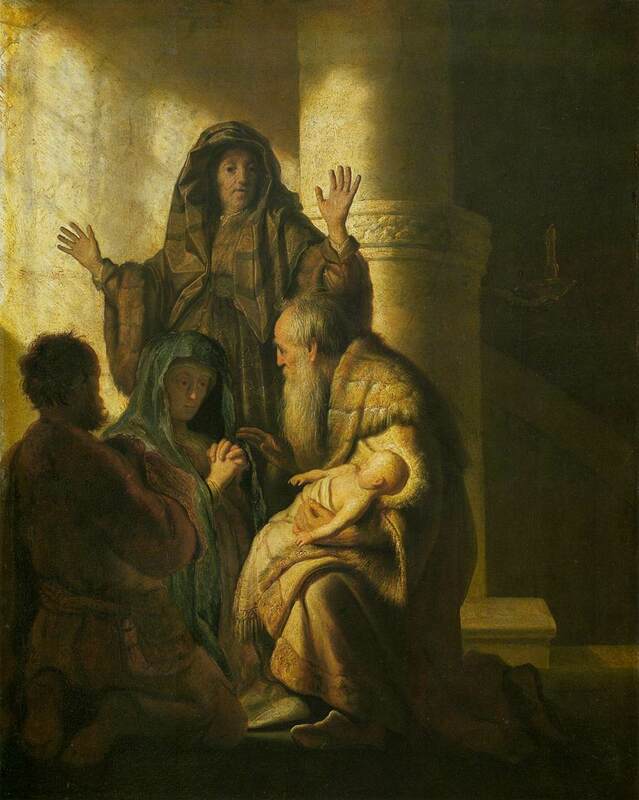 The image above shows a painting by Rembrandt, depicting the scene in which the aged Simeon and Anna encounter the Christ child and prophesy, which is found in the canonical gospel according to Luke, chapter 2. I would argue that Rembrandt has incorporated specific references to zodiac signs marking two important points on the Great Wheel of the year (two points which are opposite to one another) in the body posture and hand positions of Simeon and Anna in his painting -- and that in doing so he has by implication incorporated the entire sweep of the full circle of the annual cycle in his depiction of the episode in Luke chapter 2. Also note, of course, that the very name "Anna" refers to a "ring" or a "circle" and is thus used in the Latin word which signifies "a year" (the Latin words for "annual" and a "year," annualis and annus, are very close to the word anulus, which means "a ring," and although some may argue that they are not in any way related, since one is spelled with two n's and the other with only one, they are certainly very close to one another in sound, as well as conceptually, and thus it seems likely to me that there is some relation between them). In any case, the name "Anna" can be seen to share the same root as that found in familiar words such as "annual" and "anniversary." The upcoming course is presented in conjunction with Ananda University. I'm very much looking forward to it and hope that you can be part of the conversation!